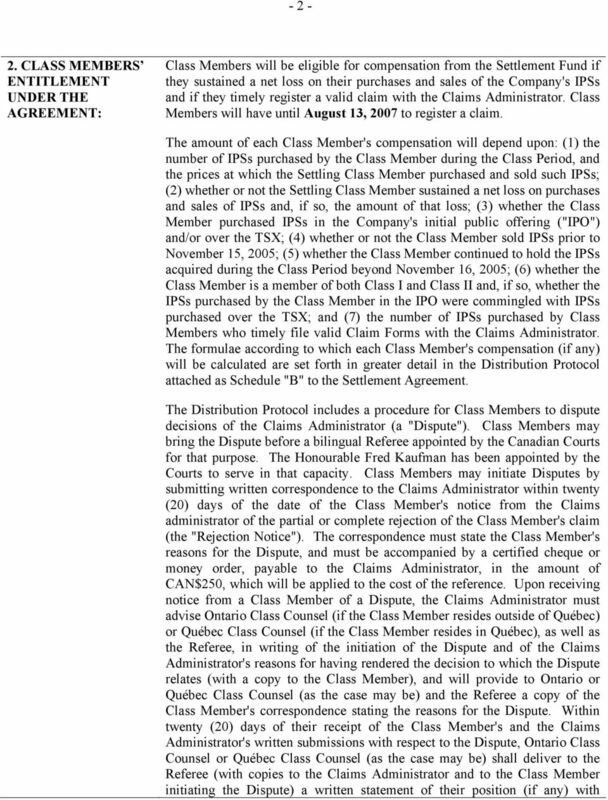 Download "All persons who: CLASS MEMBERS:"
1 FMF CAPITAL GROUP LTD. SECURITIES LITIGATION NOTICE OF COURT APPROVAL OF THE SETTLEMENT OF THESE ACTIONS PLEASE READ THIS NOTICE CAREFULLY AS IT MAY AFFECT YOUR LEGAL RIGHTS CLASS MEMBERS: All persons who: (1) purchased Income Participating Securities ( IPSs ) of FMF Capital Group Ltd. (the Company ) in the Company s March 2005 initial public offering ( IPO ) ( Class I Members ); and/or (2) purchased the Company s IPSs, or any of the securities represented by such IPSs, over the Toronto Stock Exchange ( TSX ) during the period from and including March 24, 2005 to and including November 15, 2005 ( Class II Members, and together with the Class I Members, the Global Class Members ). 1. 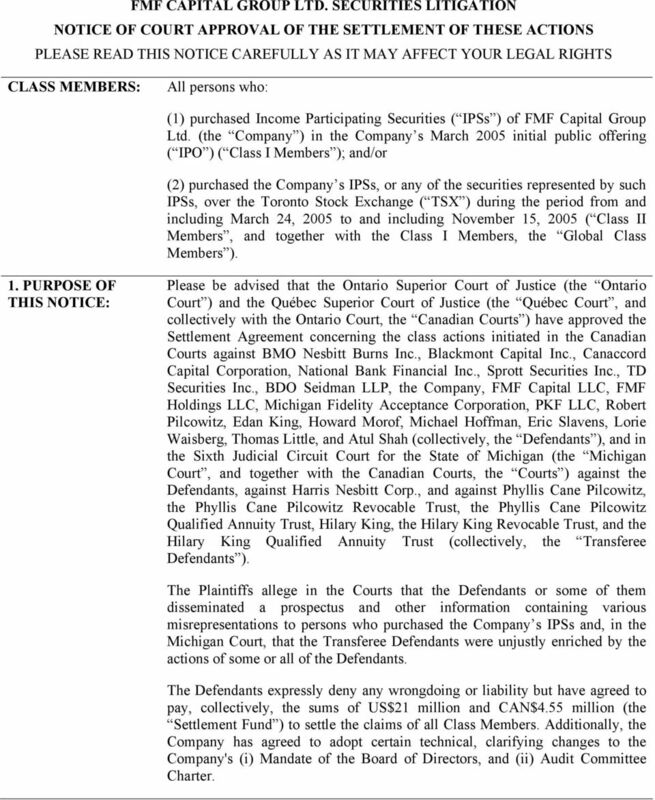 PURPOSE OF THIS NOTICE: Please be advised that the Ontario Superior Court of Justice (the Ontario Court ) and the Québec Superior Court of Justice (the Québec Court, and collectively with the Ontario Court, the Canadian Courts ) have approved the Settlement Agreement concerning the class actions initiated in the Canadian Courts against BMO Nesbitt Burns Inc., Blackmont Capital Inc., Canaccord Capital Corporation, National Bank Financial Inc., Sprott Securities Inc., TD Securities Inc., BDO Seidman LLP, the Company, FMF Capital LLC, FMF Holdings LLC, Michigan Fidelity Acceptance Corporation, PKF LLC, Robert Pilcowitz, Edan King, Howard Morof, Michael Hoffman, Eric Slavens, Lorie Waisberg, Thomas Little, and Atul Shah (collectively, the Defendants ), and in the Sixth Judicial Circuit Court for the State of Michigan (the Michigan Court, and together with the Canadian Courts, the Courts ) against the Defendants, against Harris Nesbitt Corp., and against Phyllis Cane Pilcowitz, the Phyllis Cane Pilcowitz Revocable Trust, the Phyllis Cane Pilcowitz Qualified Annuity Trust, Hilary King, the Hilary King Revocable Trust, and the Hilary King Qualified Annuity Trust (collectively, the Transferee Defendants ). The Plaintiffs allege in the Courts that the Defendants or some of them disseminated a prospectus and other information containing various misrepresentations to persons who purchased the Company s IPSs and, in the Michigan Court, that the Transferee Defendants were unjustly enriched by the actions of some or all of the Defendants. The Defendants expressly deny any wrongdoing or liability but have agreed to pay, collectively, the sums of US$21 million and CAN$4.55 million (the Settlement Fund ) to settle the claims of all Class Members. Additionally, the Company has agreed to adopt certain technical, clarifying changes to the Company's (i) Mandate of the Board of Directors, and (ii) Audit Committee Charter. 4 REGISTERING A CLAIM All claims will be administered through an online claims submission process. Those Class Members who wish to take part in the Settlement must register a claim with the Claims Administrator no later than August 13, In order to register a claim with the Claims Administrator please go to and sign in as a New Claimant, to obtain a login ID and create a password for your secure access to your Claim Form. On subsequent visits to the website you will be able to login using this information. Once logged in you will be required to complete, print and sign the online Claim Form before faxing it, along with the appropriate supporting documentation, to the Claims Administrator. The information will be uploaded to your online Claim where you may review the completeness and status of your claim. If you have trouble accessing the online system, do not have internet access, or prefer to not to register your claim online, please contact the Claims Administrator directly by ing telephoning , or writing to Claims Administrator - FMF Class Action Settlement, Deloitte & Touche LLP, Suite 1700, 5140 Yonge Street, Toronto, ON, M2N 6L7, and they will assist you in obtaining a hard copy Claim Form. 5. OPTING OUT: All persons who come within the definition of the Class will automatically be included in the Class unless they exclude themselves from the Class ( Opt Out ). If you Opt Out, you will not be bound by the Settlement Agreement, but you will not be eligible for any of the benefits of the Settlement Agreement. This means that you will be barred from making a claim and receiving payment pursuant to the Settlement Agreement. If you wish to Opt Out of the settlement, you must complete an online Claim Form by going to and signing in as a New Claimant. You will be asked whether you would like to Opt Out of the settlement and you must indicate Yes in order to validly Opt Out (an Opt Out Claim ). 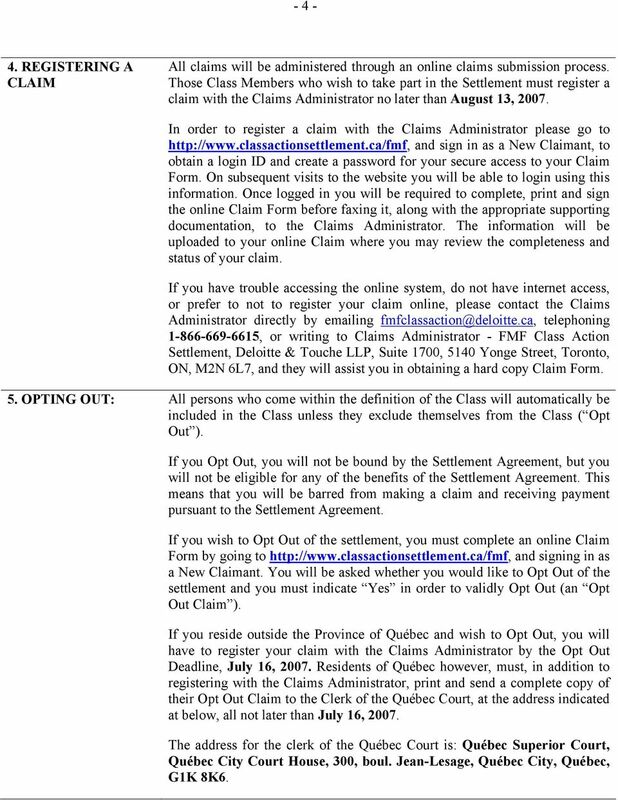 If you reside outside the Province of Québec and wish to Opt Out, you will have to register your claim with the Claims Administrator by the Opt Out Deadline, July 16, Residents of Québec however, must, in addition to registering with the Claims Administrator, print and send a complete copy of their Opt Out Claim to the Clerk of the Québec Court, at the address indicated at below, all not later than July 16, The address for the clerk of the Québec Court is: Québec Superior Court, Québec City Court House, 300, boul. Jean-Lesage, Québec City, Québec, G1K 8K6. 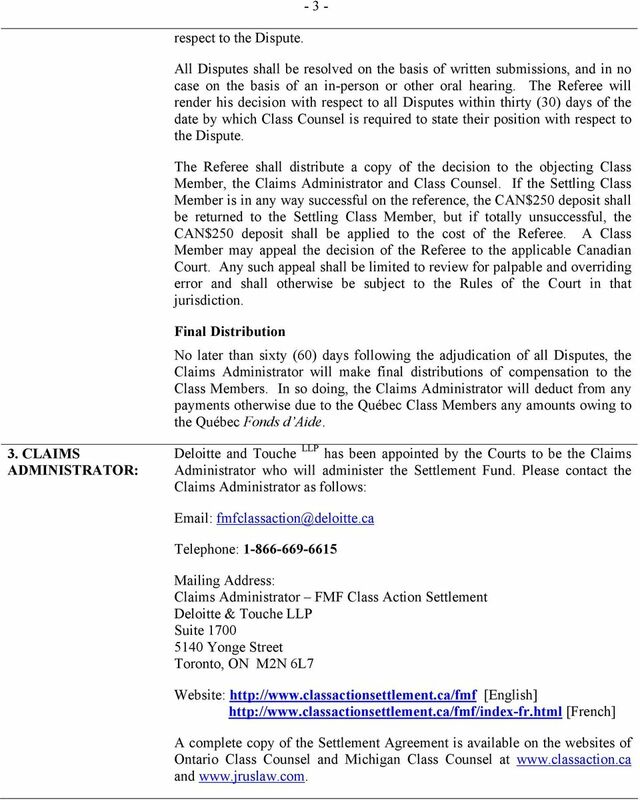 NOTICE OF CERTIFICATION FOR SETTLEMENT PURPOSES, SETTLEMENT APPROVAL AND CLAIMS PROCESS IN THE CHOCOLATE PRODUCTS CLASS ACTION LITIGATION PLEASE READ THIS NOTICE CAREFULLY. IT MAY AFFECT YOUR LEGAL RIGHTS. IN THE SUPREME COURT OF BRITISH COLUMBIA DOROTHY YOUNG SHELL CANADA LIMITED. Brought under the Class Proceedings Act, R.S.B.C. 1996, c.
Health care providers may be affected by a proposed class action settlement. 14 TH JUDICIAL DISTRICT COURT IN AND FOR THE PARISH OF CALCASIEU, LOUISIANA Health care providers may be affected by a proposed class action settlement. All health care providers in Louisiana from Jan.
CASE 0:10-cv-00851-SRN-TNL Document 437 Filed 03/09/15 Page 1 of 8 UNITED STATES DISTRICT COURT DISTRICT OF MINNESOTA In re ST. JUDE MEDICAL, INC. SECURITIES LITIGATION This Document Relates To: ALL ACTIONS. UNITED STATES DISTRICT COURT NORTHERN DISTRICT OF CALIFORNIA VERA WILLNER, ET AL. V. MANPOWER INC., CASE NO. 3:11-CV-02846-JST (MEJ) IMPORTANT: You are not being sued. Please read this Notice carefully. You have been identified as a member of a Class which has been the subject of a settlement. This settlement may affect your rights. Notice of Class Action Lawsuit and Proposed Settlement. You May be Entitled to Receive a Settlement Payment. LEGAL RIGHTS AND OPTIONS IN THIS LAWSUIT: The only way to potentially receive money from this Settlement. LEGAL NOTICE UNITED STATES DISTRICT COURT FOR THE DISTRICT OF MINNESOTA Individuals Whose Minnesota Driver s License Records Were Accessed for Illegitimate Reasons May Benefit from a Class Action Settlement. A federal court authorized this Notice. This is not a solicitation from a lawyer. UNITED STATES DISTRICT COURT FOR THE EASTERN DISTRICT OF NEW YORK. DAVID HIMBER V. AUTOMOBILE CLUB OF NEW YORK, INC. CASE NO. : 09 Civ. In re Convergent Telephone Consumer Protection Act Litigation United States District Court, District of Connecticut Case No. SUPERIOR COURT OF THE STATE OF CALIFORNIA FOR THE COUNTY OF LOS ANGELES Ilya Zaydenberg v. Crocs Retail, Inc., et al. Los Angeles County Superior Court Case No. BC554214; Christopher S. DuRee, et al. v.
You Could Get Money from a Class Action Settlement if You Paid for Medical Services at a Michigan Hospital from January 1, 2006 to June 23, 2014. The two sides disagree on how much money, if any, could have been awarded if Plaintiffs, on behalf of the class, were to prevail at trial. This Notice applies to you if you have had a parking ticket issued at one of the MBTA s Honor Box Parking Lots. NOTICE OF PROPOSED CLASS ACTION SETTLEMENT AND RELEASE OF CLAIMS If you are a current or former installation technician of Cable Communications, Inc. and worked in Oregon, please read this Notice carefully. Your legal rights are affected even if you do nothing. Please read this notice carefully. SUMMARY OF SETTLEMENT. 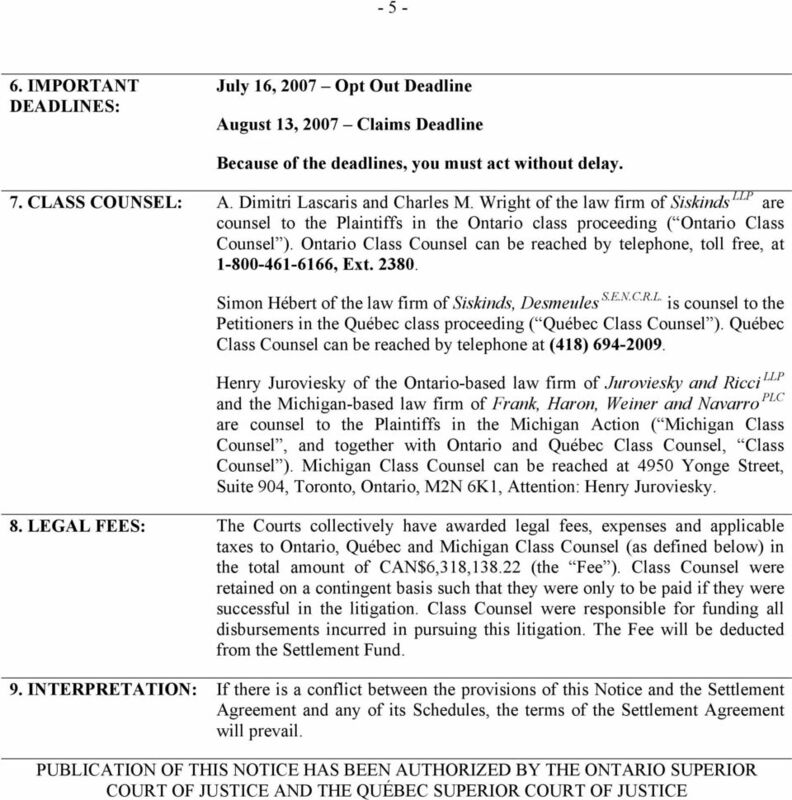 This notice explains the lawsuit, the settlement, your rights and the potential distribution of settlement funds.